It never ceases to amaze me how much good wine is available on our doorstep and how difficult it can be to find Barbaresco and Barolo abroad particularly in the UK. I suppose importers and retailers focus principally on volume or price/reputation i.e sell lots at low margin or a few with decent mark ups. For anyone in Europe or the UK it provides the impetus to jump in the car, drive through the Alps and fill up direct! 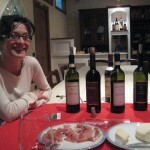 Through our friend Kerrie, whose daughters go to school with Sylvia Borgogno’s in Barolo, we popped in at lunchtime recently for some excellent local ham and cheese and a glass or 2 to wash it down. 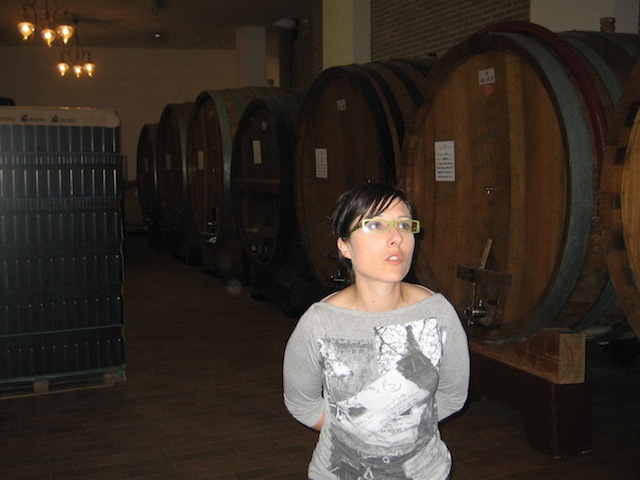 Website : Borgogno FrancescoSylvia was an excellent host and we were also lucky to meet papa Francesco who took over the small family run winery around 60 years ago. He has now passed on the day to day running to his sons and not least his knowledge. As he explained it to me: school taught him to read and write but everything else he learnt from his parents and nature. My Italian is improving to the point that I can have these conversations but confusion is never far away. While Kerrie and Sylvia were talking about kid’s swimming goggles (occhiali di nuoto), HO (Her Outdoors) was wrestling with the relevance of dead birds (uccelli morti). I know it doesn’t look the same but, spoken quickly and out of context, easily done. Barolo 2006 Brunate, one of the very best sites in La Morra. Excellent, approachable and not as tannic as I expected with excellent tarry length. Sylvia puts this perception down to the marketing by some, driven by the need to sell earlier vintages. Like all Nebbiolo it needs time and oxygen and this lovely wine kept changing as it spent more time in the glass. The experience is not expensive. Langhe Nebbiolo 2009 spent 8 months in tonneau and surprisingly was quite dark in colour but rich and a great introduction to the grape. Barbera d’Alba 2009 , opened an hour before, was light and fruity (still 13.5°) but with excellent, unaggressive acidity. It too changed in the glass and after 30 minutes it reminded me of apple pie. Not far away in the beautiful Barolo hillside village of Serralunga d’Alba sits the cantina of Massolino, an altogether bigger enterprise with production of more than 100k bottles. Nevertheless the business is run by the 4th generation of the family. Their wines gain many plaudits (Decanter, Wine Advocate, Gambero Rosso, Duemilavini) and the prices reflect that. The cantina is undergoing extensive renovation so we had to pick our way carefully through the work and bumped into the electrician who wired the lights in our garage. 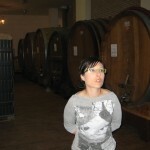 Our guide was Serenella Riva who could still find the cellar and led us through the tasting.